"It looks like the whole world is going to pot, so in protest I'm going to commit suicide by jumping off the city hall roof." As an immigrant himself, Frank Capra may seem an unlikely character for building stories of American heroes, the common man who rises against the power of the establishment, and brings the simple folk together to right the injustices of the world. Few movie fans would be unfamiliar with his 1946 holiday classic, It's A Wonderful Life, in which the hero feels his only worth to his family will be in his own death; that is, until he is shown how valuable his life is to other people. Meet John Doe follows the story of a fabricated everyman, who has pledged to end his life as a statement against the increasing hold corporate America has on the people, and the unemployment and hardship it is causing. The script was based on Richard Connell's 1922 short story, A Reputation, which was later the basis for a play entitled The World is an Eightball. Following a similar theme about a character manipulated by a cynical press that Capra used in his earlier, The Miracle Woman, Meet John Doe takes the average guy, and elevates him into the national spotlight, where those behind the scenes use him to their advantage. The Tribune has a new owner, replacing its motto of "A Free Press for a Free People" with the New Tribune's "A Streamlined Press for a Streamlined Age." Part of this streamlining comes in the form of new editor Henry Connell (James Gleason), who has been sent in to clean out the dead wood. Ann Mitchell (Barbara Stanwyck), a woman supporting her mother and two children, is a columnist whose job is on the chopping block. In order to save her career, she writes a fictitious letter as her final column, from one John Doe, a man down on his luck and upset at the system, who vows to leap to his death on Christmas Eve from the roof of the town hall. The column causes an uproar, with letters and phone calls coming in by the thousands. Connell deliberates on the story and decides he must kill it immediately, but when the rival paper accuses the New Tribune of fraud, Ann steps in and devises a scheme to drive up circulation by perpetuating the tale, and for hiring a ringer to pose as John Doe. A group of unemployed men creates the perfect opportunity to find such a man, and when Long John Willoughby (Gary Cooper), an ex-baseball player turned drifter, is offered the job, he reluctantly accepts as he is in a desperate state. Against the advice of his best friend (Walter Brennan as The Colonel), who warns him of the evils of becoming involved, John continues to play along with the ruse, not minding the perks of his position, and the chance to pay for the surgery required to fix his pitching arm. As support for John Doe and increased pleading that he reconsider his suicide come from the public, the newspaper's new owner, D. B. Norton (Edward Arnold) sees the political potential for the cause of the average man, and encourages Ann to write a speech for John Doe's radio debut. Drawing on inspiration from her father, she constructs an impassioned message extolling the virtues of community, and that every John Doe should be counted in society. Norton encourages the formation of a new apolitical John Doe Society to bolster this new found neighborliness, but as the idealism of John Doe reaches the masses, and support snowballs into a national phenomenon, Willoughby's real identity as a sham is something he has to come to terms with. Unlike earlier Capra films such as Mr. Deeds Goes To Town or Mr. Smith Goes To Washington where the hero was based on old-fashioned American principles, the main characters in Meet John Doe all have decidedly self-serving interests. John Willoughby just wants to have his arm fixed so he can return to baseball, has no family roots and an ambiguous morality. Even as he espouses the many causes he apparently stands for, he has a marked disinterest in all but his own benefits. Ann Mitchell is a conspiring manipulator, bent on moving herself up the social ladder, despite having somewhat honorable reasons behind her motivation. And D. B. Norton has his fascist leanings emphasized with his own private police force. Most critics agree that the major failing of Meet John Doe is its ending. Capra struggled through 6 different variations (the final of which was not cut until the film was already in theaters), feeling a 1940s audience would in no way accept Gary Cooper committing suicide, which was the original idea. Considering that era from a historical perspective, one might suggest that his swipes at Fascism and the bonding together of the "common man" could be seen as fitting propaganda, as the U.S. was about to be thrust into World War II. The concept of martyrdom also plays an important role in this film, as it did in It's A Wonderful Life, though Meet John Doe's connection with another famous martyr plays a bit heavy-handed. 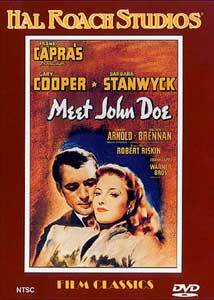 Hailed since its release as a top ten film by the critics, it is interesting to note that some of Capra's earlier work, which he considered his finer films, and which were responsible for putting Columbia Pictures into the major leagues, were often overshadowed by Meet John Doe. Image Transfer Review: Meet John Doe is presented in its original 1.33:1 aspect ratio, and is noted as being restored from the 35mm nitrate negatives. For a film from the 1940s it is in reasonable shape, though it is obvious that the elements used for the restoration came from a variety of sources, as the image quality varies even within scenes, which will have the middle sections spliced in with a different black level in the middle of a shot. There are also many jump cuts throughout the feature, and print damae is evident especially around the reel changes. While the image is not a crisp and clean as a few other films from this era, it is still very watchable, and is in quite fine condition for the most part, though it does show its age. Audio Transfer Review: The soundtrack is in two channel mono, and does contain anomalies to be expected in a film of this vintage. There is a fair amount of hiss at times, and some distortion and crackling on occasion. There are a half dozen dropouts especially at splice points, and audio defects are most prevalent around reel changes. Despite these imperfections, the result is still highly servicable, and don't detract from the viewing experience greatly. The strangest anomaly is the opening logo sequence, which has audio coming from the rear channel speakers for just the Warner logo. Extras Review: Static chapter menus are the extent of the extras here. The inside flap of the case lists other restoration projects under way by Hal Roach studios. While a bit heavy on idealism, Meet John Doe is nonetheless an entertaining bit of history. Since this title is now in the public domain, it is available form many sources, though this is probably the best the film can look given the years it has had to deteriorate. Restored by Hal Roach Studios, the company responsible for bringing Laurel & Hardy to the screen in the 1930s, Meet John Doe joins other Capra classics also available in restored versions on DVD.